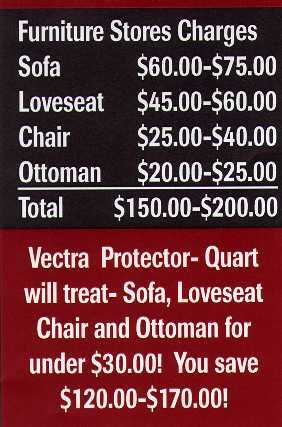 VECTRA®--Now available direct to the industry in quart, half gallon and gallon size containers. Now YOU CAN BE IN TOTAL CONTROL of your job. No more hassles over scheduling fabric protection and wondering who can get the job done. 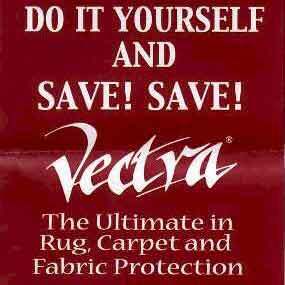 Now you can get the job done with VECTRA®, the world's best fabric protection for SELF-APPLICATION on the market today. A gentle misting is all that is necessary to provide maximum protection for your clients' fine furnishings and carpeting. Each container of VECTRA® comes equipped with applicator and instruction sheet--READY TO SPRAY. No dimensional change in fabric or carpet. No change of color or texture. Lasting resistance to abrasion and wear. Retains over 80% effectiveness after 2 years of normal use. Retains effectiveness through several cleaning cycles(when cleaned as directed). 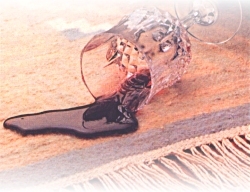 Increases the durability and life of all fabrics.